The Lift-and-Dump Hydraulic Drum Dumper is what you need to dump drums at variable heights. The V-HLD works similarly to the V-HDD but includes a lift cylinder that allows you to dump at various heights. Features a (4) push button pendant which allows the operator full independent control of both lift height and the dump angle. 120V 1-phase power standard. ZORIN offers the ability to customize a wide variety of there product line to meet your spcific needs. Please call (888) 378-6525 to discuss your application no matter how customized. 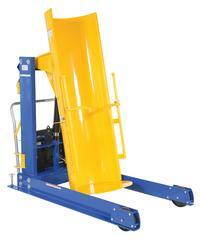 Hydraulic Drum Dumpers - Only need to lift up to 72"?